The Project 36 team with locals in Tanahun, Nepal. Chris Youngman – far right. 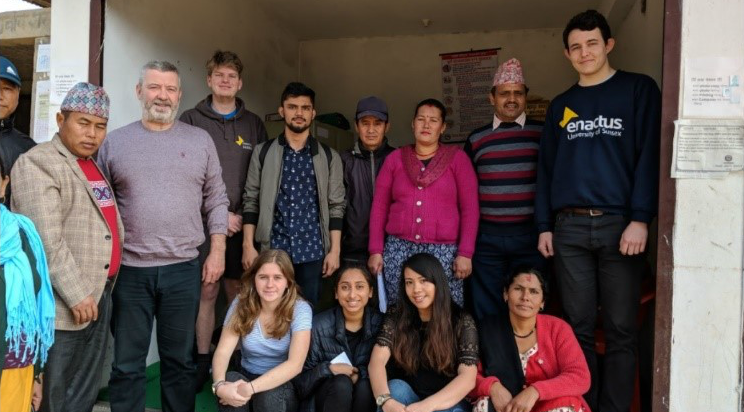 Project 36 is an international community project based in Nepal, run by the students of the University of Sussex. This project is being undertaken to locally tackle the global issue of Iron Deficiency Anaemia (IDA). This problem is especially widespread in developing countries such as Nepal; where due to poor health systems, issues such as IDA are magnified. Therefore, taking any action to alleviate this cause would be highly beneficial to such communities and economies. The idea for this project was established from a striking fact that 36% of women and 48% of children suffer from IDA in Nepal. Hence, the name “Project 36”, as we are focusing on women and children. In January of 2018, we took action to implement the first step of our project and carried our ‘Needs and Wants’ assessment. A group of 6 students went to Paimey; a rural village in Tanahun, Nepal. The aim of this expedition was to acquaint and build relationships with our beneficiaries and project partners for our social enterprise. Additionally, we wanted to raise awareness of the prevalent issue of IDA along with other problems that they face. We spent ten days in this village experiencing the lifestyle, culture and customs of the locals. We were very kindly housed and fed by the chairwoman of the local women’s council who was able to initiate many conversations around the area. We conducted 6 workshops in 2 different schools, carried out 50 surveys of the community and supported a local paramedic in conducting 25 blood tests to identify haemoglobin levels. Most importantly, we built concrete partnership with the local government, women’s institute and schools in Paimey. The future of the Project 36 is looking promising. We welcome and encourage any enthusiastic students from the Business Schoolwho are interested in the project to come join us. Email presidentenactussussex@gmail.com for more information on how to join the project. We may make minor edits to posts and provide contributors with topics to write about that we think will be of interest to students, but we never tell them what to write. Their thoughts and opinions are their own and are based on their own personal experiences of studying at the University of Sussex Business School. The views expressed in these blog posts are those of the individual who wrote them and should not be construed as the views of the University of Sussex Business School.